So Waking the Dead’s run ended with a romantic twist for Boyd. Slightly subtler than CSI’s Sarah/Grisham matching dressing gown crime scene and foreshadowed a little more in the plot too. I’ve also been working on Serious and Organised. Boring equipment list creation. I’m torn between generic kits for different tasks and long lists of actual equipment or a mix of the two approaches. 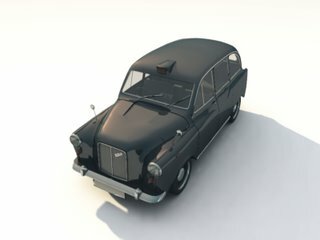 The picture is another test render of a model of a black cab model from Design ModÃ©lisation Image. Black cabs have a way of appearing in British police shows so it will probably appear in the artwork somewhere. I miss the Black Cab,we used to have them where I live but they did away with them years ago !